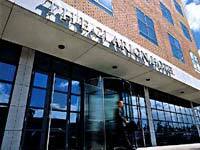 A superior hotel The Clarion Hotel Dublin IFSC is situated in the heart of Dublin's docklands. This stunning hotel provides calm, tranquility, extreme friendliness and exceptional attention to detail. It provides the perfect atmosphere for the guest to unwind after a stressful day shopping or in the board room. The hotel offers state of the art accommodation, cuisine and beverages, and a health club and spa. Children (under 18) are permitted in Sanovitae swimming pool only, Mon-Sun from 09.00am - 12.00pm and 14.00- 17.00. Swimming hats are mandatory. The 147 modern en suite rooms in The Clarion Hotel Dublin IFSC are beautifully decorated and facilities include TV, direct dial telephones, ISDN lines, and air conditioning. Special needs facilities are available. The hotel also offers essential facilities including child minding and car parking designed to make your stay trouble free. The guest in The Clarion Hotel Dublin IFSC will be spoiled for choice. The hotel is home to the fashionable Sinergie Restaurant, which serves fresh seasonal food prepared to the highest standards by top class chefs. The Savour serves a wide variety of teas and coffees throughout the day with a wide selection of pastries, snacks and wickedly delicious deserts. Kudos bar in the hotel is a smart urban bar serving Asian food straight from the wok. Located in the International Financial Services Centre (IFSC), the hotel is just a short wander away from Grafton Street famed as Dublin’s best shopping street. Trendy Temple Bar with its fine selection of bars, cafes, restaurants and galleries is close by. The National Gallery, The Natural History Museum and Dail Eireann, are all within easy reach of the hotel.